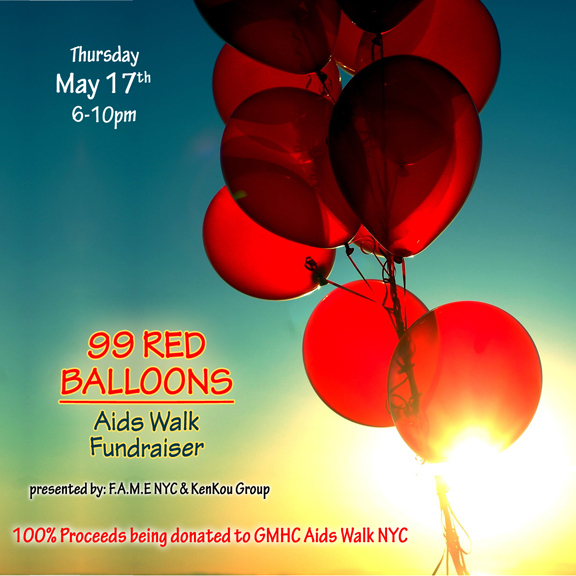 On May 17th, F.A.M.E NYC in conjunction with The Kenkou Group hosted its annual 99 Red Balloons AIDS Walk Fundraiser. Because of this event, F.A.M.E NYC was able to meet and exceed its pledge to raise $300 for GMHC’s 2012 AIDS Walk. We were blessed with a beautiful night and when I saw those balloons ascend into the sapphire sky, I became very emotional. For me, each of those balloons represented someone that I had admired who had passed away from AIDS or are living with it. The three balloons I released from my hands were for my three brothers and their experiences were the genesis for this event. Throughout the evening many people asked me how I came up with the concept for 99 Red Balloons. Part of the idea came from the 1984 new wave song from Nena titled, “99 Luftballons”. The other part came from the fact that by 1999 I had lost two brothers from AIDS and had another brother living with the illness. In a span of 10 years, my family had been decimated by this epidemic. AIDS had touched a third of my immediate family. Because HIV/AIDS has been a part of our global landscape for so long, people forget how terrifying this disease was when it first began receiving media coverage. It was the equivalent ofa biblical plague and those who were diagnosed with it were the most fiendish sinners. People treated those with AIDS and their family like outcasts. I was 13 when my first brother was diagnosed with AIDS in 1988. It was my last opportunity I had to give my brother a hug and I couldn’t touch him without wearing gloves, a mask and other medical garb. A month after he was rushed to the hospital he was gone. I remember being instructed by my mother on what to say about my brother’s death. She feared being ostracized by our neighborhood as others had been. When my second passed away in 1997, I knew I had to join the fight to raise awareness and find a cure. Although last Thursday’s event was titled 99 Red Balloons, the subtitle should’ve been “With A Little Help from My Friends”. Without them, I wouldn’t have been able to make this event happen. First, I must extend a massive thank you to The Kenkou Group for partnering with me. The Kenkou Group, http://www.thekenkougroup.com, is a concierge health care and advocacy group out of Harlem. Being from an area where its residents are at high-risk for new AIDS cases, their concern, passion and assistance were invaluable. They treated this event with the same dignity and care as one of their patients. Thank you to Joann Jimenez, Creative Director of ¡WEPA!, for your unwavering support. Thank you Jim Glaub and Serino Coyne and Jessica Porter of Porter Gallery for your wonderful donation, I truly believe the event wouldn’t have gone as well without your assistance. Thank you Gabe and everyone at Bar 13 for allowing us to have our fundraiser at your venue, you guys are the best! Thank you DJ Omar Abdallah for a blazing DJ set, you knocked my Pumas off. Most importantly, thank you to everyone who attended and donated. You are the reason this fundraiser was a success. 99 Red Balloons AIDS Walk Fundraiser was the beginning of a bittersweet weekend that culminated with today’s AIDS Walk. And as the anniversary of my brother’s death fast approaches, I firmly continue to honor my brothers by making sure I do what I can to lend my voice and energy to a cause that affects us all.